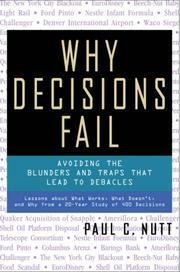 Based on the his analysis of 400 strategic decisions made by top managers in areas such as products and services, pricing and markets, personnel policy, technology acquisition, and strategic reorganization, Nutt estimates that two-thirds of all decisions are based on failure-prone or questionable tactics. He uses the fifteen monumental decision-making disasters to illustrate the potential consequences of these common tactical errors and traps and then details successful alternative decision-making approaches. Why Decisions Fail translates decades of award-winning research into practical terms that managers can use to improve their own decision-making practices.